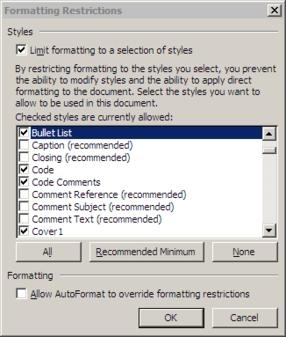 I’ve written before about Microsoft Word’s cavalier attitude to adding extra styles to documents. 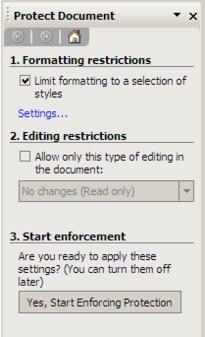 At the end of that post I mentioned it is possible to restrict the formatting of a document and prevent users (or yourself!) from applying styles that aren’t explicitly made available. I thought it would be useful to document that process as I have recently decided it’s worth applying to one of my documents to prevent Adobe Acrobat from corrupting the available styles. One thing worth noting at the outset. This option isn’t available on Word for Mac OS X as far as I can tell. This is one of those instances where the Mac version of Word is dumbed-down compared to the versions for Windows. Select Protect Document… from the Tools menu. This will bring up the pane shown below. Check the option to Limit formatting to a selection of styles and then click the settings link to allow the permitted styles to be selected. 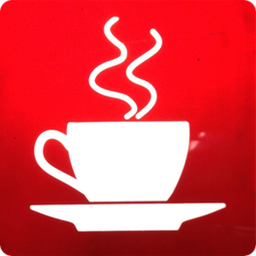 Start enforcement and enter a password if required. With formatting restrictions in place, a number of formatting tools, commands, and keystrokes are greyed out as unavailable and built-in styles such as bold, italic and underline won’t be available directly but need to be defined styles.